Select dates and location in February. The audience chooses what happens to the characters! Over a span of 50 years, Melissa and Andy write letters to each other. They write in times of joy, sorrow, just to catch up, to invite, share their dreams and simply stay connected to one another, even though distance and different lifestyles keep them apart.Hilarious and poignant, this is the perfect play for Valentine’s! Dial Tones is the heartwarming and humorous tale of a very unique love triangle! Written by J. Scott Bronson, and directed by Lynne Bronson. Playing at the Covey Center. Don't miss Ballet West's performance of Sleeping Beauty! Take a romantic helicopter ride over downtown Logan. Many packages available. What a cool way to spend valentines! Give your sweetheart or loved one a valentine gift that he or she can show off to everyone!! 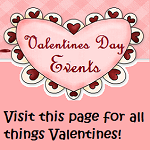 Join us for Valentine buttons! For teens grades 6th-12th. February 7th - 14th. Click the link for a full list of local events and activities. Cupid is Stupid Party with B98.7: Valentines Day isn't just for the marrieds and in-love! Celebrate with B98.7 at a FREE event!!!!! Thrs. Feb. 10th at Kearns High School. Join hilarious Matt Townsend at Noah's in South Jordan. Friday Feb. 11th from 7pm to 10pm. Need to woo your valentine? Bring a date to BYU's Museum Of Peoples and Cultures (MPC) to experience a night of Egyptian culture and cuisine on Friday Feb 11th 7pm. Friday Feb 11th 7pm in the Eagle Mountain City Chambers. Valentines Dinner and Dance Learn to dance the tango! Singles and couples welcome! Learn how truly elegant and romantic dancing can be. February 12th 7pm to Midnight. Feb. 12th. Located at the Provo City Library. Purchase tickets in advance! Catered dinner included. Monday February 14th - VALENTINES DAY! Monday February 14th 6pm to 10pm at Thanksgiving Point. This event usually sells out, so make sure you purchase tickets as soon as possilble! Eventos and Cafe Brasil in Salt Lake City host a romantic Valentines Day Dinner. Kids 10 and under are free! Purchase tickets ahead of time, as they sell out fast! Monday February 14th 5pm to 8pm. You must make reservations. Wabi Sabi at Daybreak Five Course Meal: Treat your loved one to a special dinner and more at Daybreak! Get treated like royalty at Gardner Village. Feb. 19th. Teens come celebrate the end of Chocolate Lovers' Month as we watch a movie where some kids wreak havoc in Johnny Depp's chocolate factory. Movie rated PG (for ages 12-19). What a beautiful article. I have send this blog to my friends. I like very much. I appreciate this blog.